I had a lovely chat with a couple of ladies who were having a crafternoon, I had a couple more hours to mooch around the shops before meeting mom and Ebi-kun. Mom had an appointment at the hospital so we looked to find somewhere for dinner, all the cafes were closed and the restaurants weren't open! Luckily we found Pete's Chippy that was open which had seats in the back. Pudding (or babby's yed - baby's head) from my moms neck of the woods, in the midlands, is a type of pie but the pastry uses suet pastry and it's steamed usually. Inside is usually steak and kidney, the pastry is kind of stodgy, an interesting taste! It always reminds me of camping, when I was in the scouts it was always a back up meal because it's easy to cook! 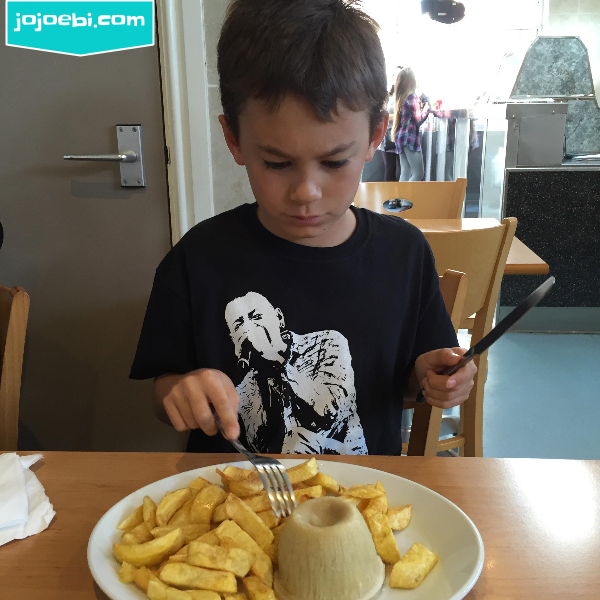 After poking it a few times he got stuck in and demolished the whole thing, pudding and chips got a big thumbs up! Not the healthiest meal but what the heck, we are on holiday!